I was able to spend last Saturday with my son, Aaron. We went to the new SFMOMA (San Francisco Museum of Modern Art). What a fantastic place. After dining on the cafeteria there we visited the Photography Gallery. On display were photos from all over the United States. Two of the displays were particularly interesting. One was where the photographer had printed the photographs and returned to the subjects and asked them to comment on the what they were thinking about in the scene. The subjects were diverse – from kids to an old couple. Most were poor and the comments were about their condition. One man with AIDS expressed the sorrow of his loneliness. The unique thing about this exhibit was that the photographer abandoned the tradition of photographers letting the images of the subjects speak for themselves and instead let the subjects add their own words to the scenes. The surprise of the day was seeing an display by Barnett Newman (1905-1970) an American artist specializing in abstract art. 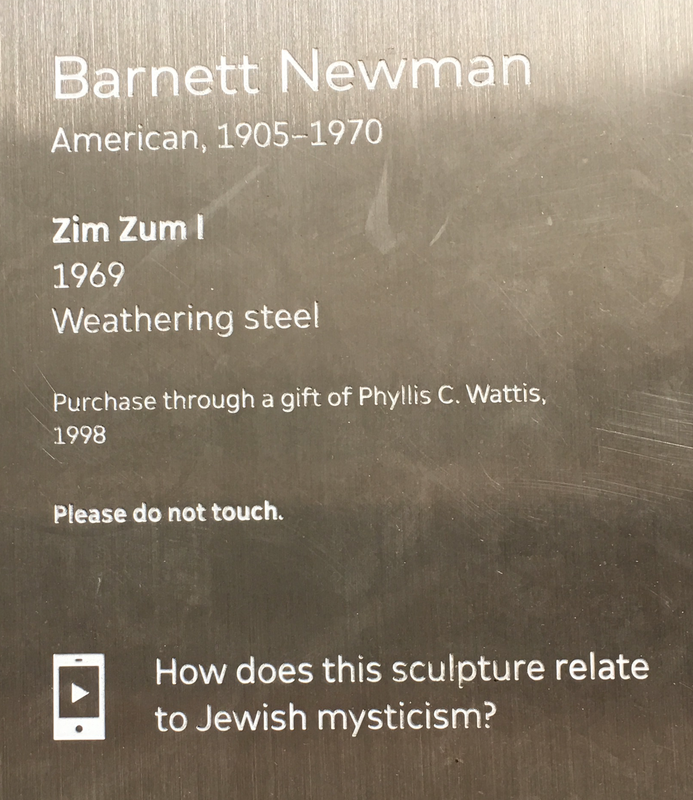 This display was entitled Zim Zum 1 (1969) – Weathering Steel a sculpture made the year before he died. 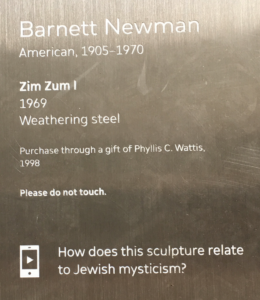 The question at the bottom of the display tag asked, “How does this sculpture relate to Jewish Mysticism?” This is something that I just had to answer. Below find the SFMOMA Podcast that answers this question. We visited several other spots around he city. The Apple Store at Union Square, the Sales Force Tower that is under construction, and the site of the new Trans Bay Transportation Center that is also under construction. This I was glad to see because I think it is real important to develop new and modern infrastructure for public transportation. Aaron sent me a video on what the Trans Bay Terminal will look like when it is finished. Aaron works for the Planning Department of the CIty and County of San Francisco and is a great tour guide in the city. It was great to spend the time with him and to see his husband Bill!